Ride the Machine: The GodMachine. "Bicycles. Cars. Cities. 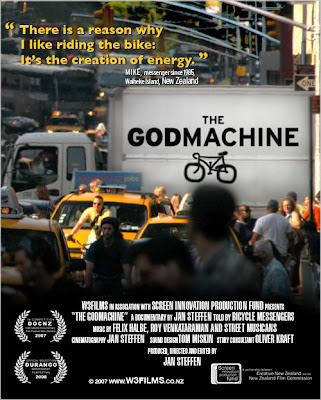 The Godmachine is a documentary that explores this complex relationship through the voices of the ones who fully live the city from a bicycle saddle: Messengers. Journeying from Waiheke Island, New Zealand to New York City and back to promote the most energy efficient vehicle there is.“They (the cities) are not changing us, may be we are changing them”, says Kevin (from NYC).., and he could be right."